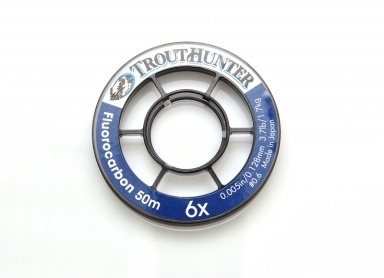 TroutHunter Fluorocarbon won the fly fishing industries "Dealers Choice Award" & recently won 1st Place at the "George Anderson's 2012 Tippet Shoot Out". Many features in our tippet and packaging system are unique and specific to the innovation of TroutHunter. ◦Superb knot strength and abrasion resistance. ◦Nearly invisible due to low refractive index. ◦50 meter spools afford anglers superior material at a low per meter price. ◦Proprietary misty gray polycarbonate large arbor spool. Designed for low material memory and easy handling in a stackable, compact, durable design. ◦Premium rubber, water repellant tippet tender. Unique colors for each diameter.